If you’re like most homeowners who struggle to put the right colors together, then you’ve got a friend in ColorCoach™ from CertainTeed. Using this free tool, you can ultimately make an informed decision when it comes to your home exterior palette. First off, the ColorCoach sheds light on everything you need to know about color psychology. Although you probably know some tried and tested combinations already, this tool lays emphasis on the key concepts you must understand to create your own palette. Even if there are no real rules when it comes to exterior design, you should use the different effects of contrasting hues and similar shades. This way, you can make color choices strategically based on your architecture’s accents and weak spots. You don’t need to be a home design expert to create hue harmony among your CT vinyl siding panels, roof, and other elements. The ColorCoach unleashes the designer in you with its practical color tips. No matter the style of your home, ColorCoach would provide you brilliant insights to choose your siding, roof, and accent colors right. You can create as many exterior palettes as you can. Using CertainTeed color blends lets your imagination run wild when experimenting with your own combinations. 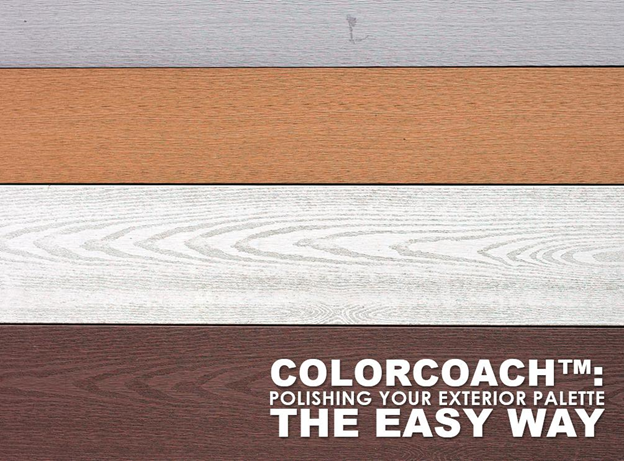 If you struggle along the way, you can simply ask ColorCoach for assistance. Once you’re done, you can share your masterpieces with your friends. Post them on social media to know what they think and get suggestions to create a more unifying theme among your horizontal vinyl siding, roof, and trim. Ready to show us your dream home exterior design? Call Vinylume now at (866) 244-8029 and let’s talk about your work.